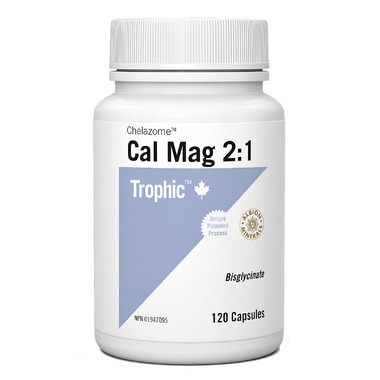 Trophic’s patented Albion Calcium and Magnesium, chelated with natural amino acids, provides superior biological activity or bioavailability and absorption. By comparison, other compounds such as calcium gluconate, calcium citrate and calcium carbonate are poorly absorbed by the small intestine as these mineral salts must undergo a complex digestive and transportation process. Trophic's formula helps to build and maintain strong bones and teeth and aids in metabolism, blood clotting, nerve transmission and regulation of heartbeat. Dietary calcium deficiency has also been associated with increased risk of hypertension, pre-eclampsia and colon cancer. Signs of magnesium deficiency include muscle tics and twitches, irregular heartbeat, convulsions, seizures, tremors and glandular disturbances. Cautions and Warnings: Avoid using two hours prior to or until four hours after taking other medications. May experience diarrhea. Manufactured under the unique Albion Laboratories’ process (patented and patents pending) whereby the minerals are chelated by amino acids, peptides and polypeptides. Love this product! The capsules are much smaller and easier to swallow than my old brand and I only have to take 2 capsules instead of four so it makes up for the price difference.